Sprint EVO gets OTA Update | Android Blast! 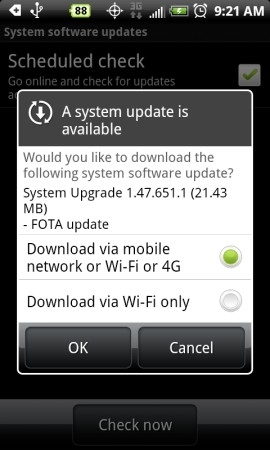 Sprint is pushing out their OTA update for the EVO this morning. The update is supposed to provide improved WiFi performance, as well as fix bugs with the Exchange ActiveSync, and social networking sync bug that drains the battery. The update is relatively painless, but you will likely have to delete and re-add some widgets to your home screen if you have them. After the update some widgets report "Problem loading" and they need to be redone. This update does not address the screen sensitivity issue which is disappointing. Hopefully HTC will release a fix soon. Sometimes being an early adopter is painful.